The accident happened on the A92 north of Redhouse Roundabout. 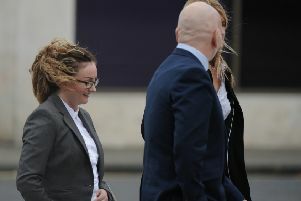 A lorry driver, who ploughed into the back of a car on the A92 killing the female driver and her eight-year-old passenger has avoided a jail term. Donald Maguire admitted his careless driving caused the horrific collision and could offer no explanation for not seeing their car stop ahead of him after it lost power. HGV driver Maguire was not paying attention to the road in front of him and smashed into the back of the Ford Focus on the A92 near Kirkcaldy in 2016. The car driver Monika Lewandowska-Ritchie (36) and eight-year-old passenger Bartlomiej Plachta both died. Another eight-year-old boy, also travelling in the back of the car, was severely injured. Maguire (56), of Waverley Drive, Glenrothes, appeared at Dunfermline Sheriff Court today (Tuesday) for sentencing. He previously admitted that on April 4, 2016 on the A92 near the Redhouse Roundabout he caused the two deaths by driving without due care and attention and failing to pay proper attention to the road in front of him. As a result, he caused a collision, whereby an eight-year-old boy was severely injured and two occupants of the vehicle were both so severely injured that they died. The accident took place at about 2.55pm on a Monday afternoon north of the Redhouse Roundabout, outside Kirkcaldy. The young victim, known as Bartek, on holiday from his home in Poland, died at the scene of the crash and Ms Lewandowska-Ritchie died in hospital. A 36-year-old male passenger in the car was not injured. Depute fiscal John Adams previously told the court that Maguire was driving back to Glenrothes when the accident occurred. He had told police the Ford Focus “stopped in front of me and put the flashers on”. Maguire said there was also car at the side of him and there was nothing he could do to avoid the collision. However, Maguire later changed his position saying he could not remember what happened and could not explain why he had not braked. Police investigations showed no evidence of the lorry braking. Tachograph evidence confirmed the lorry had been travelling at 50mph and had not slowed down before the collision. The injured boy required extensive facial surgery on his left cheekbone and eye socket. He may require further surgery on his lip, which was badly injured and his speech is affected. Defence advocate Barry Smith said, “The circumstances of this tragic accident and its terrible consequences have taken a considerable toll on Mr Maguire. “He has said to me that he has thought about it every day since it happened and does not see that changing. “He has shown genuine remorse. He has a daughter around the same age as the young boy who died and as such is very empathetic to the relatives. Mr Smith said his client had been in constant employment since leaving the army and was currently working at Amazon as a warehouse operative. Sheriff Craig McSherry imposed a community payback order with 300 hours of unpaid work and two years’ supervision. Maguire was also banned from driving for two years.